Description:Easy to handle -simple on/off button for easy operation -easy to clean with a damp cloth -make your milk all frothy, great for making cappuccino, white coffee and milk shake at home -can be also used for crack egg, quickly mush eggs without spilt around. 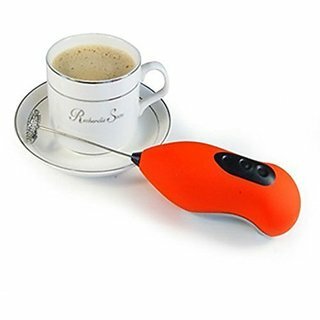 A drink frother is an inexpensive kitchen gadget that will make your morning coffee much more exciting.it quickly and easily whisks up warm milk,creating form similar to what you get with a latte or a cappuccino. Unlike a cappuccino, though,the milk frother is easy to clean up and small,so it can be stored just about anywhere. This tool is easy to use and gives you a fancy coffee within seconds. Colour will be send as per availability.Product Detail:Powered by 2 AA batteries (not included)Stainless steel spring and the body is made of ABS plasticSize : 20 cm x 4 cm.